There's something about making a quilt for someone who you know will appreciate it. There's also something about making a quilt for another quilter. Thanks to the CJMQG, we get the opportunity every January to make a secret gift for someone else in our guild (a late Secret Santa). She made me a paper pieced TARDIS!!! And included the AMH Socialite Dress pattern! Ahhh! Can you believe she got me, too? I am so proud of this quilt because all except two of those HSTs are perfectly lined up (Amy, I dare you to find them!!). I have to thank the Sister's Ten BOM from last year for that! It was hard for me to cut into these fabrics (like I said, some of my favorites e.v.e.r.) but it was for a good cause... I may have shed a tear or two. Oh well. I have to admit it's prettier seeing the fabrics all quilted up, which is why I call this one "Diamond in the Rough." I was inspired by one of Amy's pins, this quilt that Anna Maria Horner herself made (I think? I can't seem to find out for sure) for Fall 2013 Quilt Market (I've had it pinned myself, hehe). UPDATED: Ironically, Anna Maria posted about this quilt, "Color Dive," today, and the class that's coming on Creative Bug! I also used this opportunity to experiment with my FMQ some more - each colors has a different design. I am so pleased with it overall. 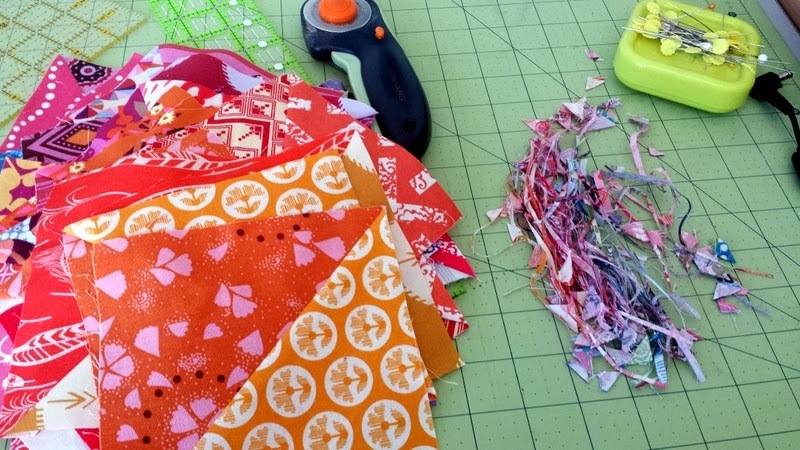 Linking up to Fabric Tuesday @ Quilt Story, Sew Cute Tuesday @ Blossom Heart Quilts, Needle and Thread Thursday @ My Quilting Infatuation, TGIFF, and Crazy Mom Quilts. Beeeeeauuuuuutiful quilt! The fabrics, colors, layout and quilting are all so pretty! I totally approve of that TARDIS, in case you were wondering--it's on the corner, has a sign and a light--all good TARDIS minis should have those things! ;-) I will attempt to make a coordinating mini to go next to it! I love the Diamond in the Rough quilt. It's beautiful! It's a lovely quilt, I can understand why you didn't want to part with it. You did a great job! What fun! What a lovely post! Quilts friends are great. Ooh I love this quilt - just my colours and patterns. Beautiful! It's beautiful! So you should be proud! Gorgeous! I love all the colors! It really is a gorgeous quilt!!! I am hoarding all of my AMH fabric until I am really good at quilting since I want to make something similar! So glad I found CJMQG - great group!!! I think you and I also have the same taste in fabric. I LOVE the saturated colors. You did such a good job with your quilt and your FMQ. If I had been Amy, I would have been thrilled so I'm sure she was too. Ooh! Nice job on the quilting! And the Tardis mini is awesome too! I love it!! You did a great job!! Beautiful! I love the rainbow. It kind of reminds me of that true colors quilt by Anna Maria Horner (which is also beautiful). Thanks for sharing! Ive study through a few of the reviews in your website at this factor. I really like the way you blog website. I included it to my most favorite blog website record and will also be checking returning quickly. Please visit my personal website as well and let me know how you experience. It's gorgeous! I just love the riot of colour! Also must saw what a cool tardis mini!! I love it! Don't you just love quilty friends:) Sounds like you two are going to have fun together. The quilting is great too, I love all the different stitches. Your Diamond quilt is just beautiful! 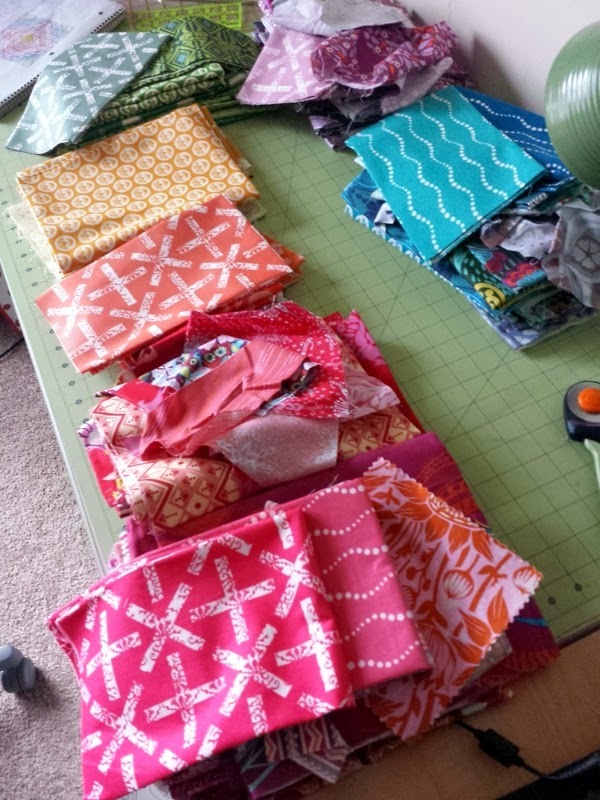 I love the colors, and your idea to try different FMQ types in each block is great! my favourite of all your makes, ever :-) Absolutely stunning Jess. Amy is one lucky lady to have such a talented and generous friend!! This is awesome!! I love how you tried out different FMQ techniques. Way to go on the triangles too! Amy is so lucky to have a gift w/ so much thought, love, & passion put into it! I love this 'diamond in the rough' beyond words! Fabulous make! Great colors! Eye candy indeed. What a wonderful quilt! And such a great name. I love how you quilted different things in the different rounds, spectacular! This is so beautiful, Jess! 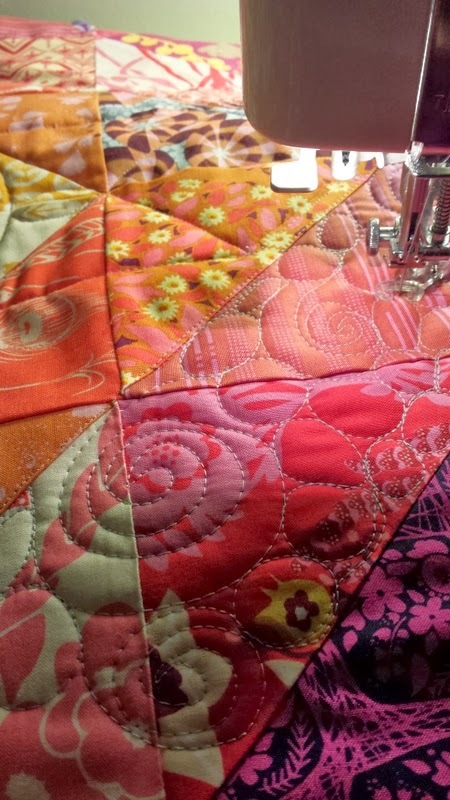 I love the vibrant colors, and your FMQ looks amazing! What a gorgeous quilt!! I just love the fabrics you used - they're stunning! Your quilting is looking so good Jess!! Way to go! How fun to make a great connection with another quilter! A nice story. Such sweet friends you are to each other. I love both of them. I really like the backing on your quilt too. Super gorgeous...loving the rainbowy colours!! This quilt is gorgeous what a lucky lady!